The original teachings of Theosophy do not very often use the term “God.” They generally speak instead of “Deity” or “The Divine Principle,” sometimes referring to IT under Hindu terms such as Parabrahm or Brahman; sometimes under the Kabbalistic term Ain-Soph – “the endless, boundless No-Thing which is everything”; sometimes as Adi-Buddhi, a term from esoteric Buddhism. Cyclic Law, including the cyclic appearance and disappearance of the Universe, is one of the fundamental aspects of the original teachings. The Universe comes into being as a result of the Logos being radiated forth from the Absolute. The Logos – meaning “Word,” “Speech,” or “Voice” in Greek – is the objective expression of the subjective and abstract Absolute. The Logos is not a personal being or a God but is the one all-ensouling light and life of the Universe, a universal spiritual Principle of existence, manifestation, and evolution. It manifests in three distinct stages, sometimes described as the Three Logoi, but it is maintained that in actuality there is only the One Logos. After the time of H.P. 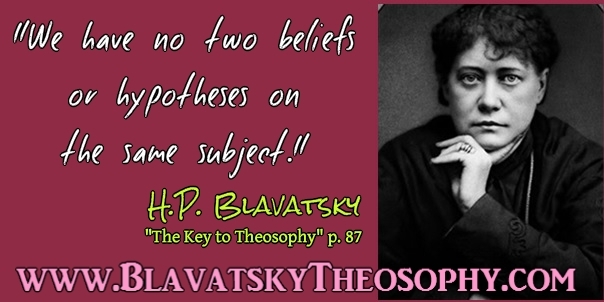 Blavatsky and William Q. Judge, a very different and contradictory system arose, also calling itself “Theosophy” and attempting to supersede the original by claiming to be a progressed, corrected, and improved version. This was primarily the work of C.W. Leadbeater and Annie Besant of “The Theosophical Society – Adyar” but was popularised and prolonged even further by Alice Bailey, an Adyar Society member who went on to found her own organisation, known as the Lucis Trust and the Arcane School. The Bailey teachings are based almost entirely on the Leadbeater/Besant teachings but have numerous additions and elaborations. In great contrast to the above, these later teachers, leaders, and writers insisted that the highest conception anyone can form of the Divine is the “Solar Logos,” which they describe as the “God of our Solar System.” Parabrahm or the Absolute is not mentioned, nor is the Universal Logos. The focus instead in those later teachings is on the “Solar Logos” and the “Planetary Logos.” In original Theosophy, the term “Solar Logos” is only ever used once and “Planetary Logos” not at all. The original teachings of Theosophy say that we possess a sevenfold nature. We are each comprised of seven “principles” or components. Three of these are immortal and endure from lifetime to lifetime, while the other four last only for the duration of one lifetime and are new with each successive birth. These lower four principles are often described as the Lower Quaternary, while the real human trinity is termed the Upper Imperishable Triad, the Spiritual Triad, or the Higher Triad. Summarised briefly, this consists of (1) Our Higher Self; pure eternal Spirit, universal and indivisible in nature – called Atman in Sanskrit, (2) Our Spiritual Soul; the vehicle for the direct radiation of the light of Spirit – called Buddhi in Sanskrit, and (3) Our individual human soul, which is our higher mind principle, our Ego or “I”, our permanent individuality, the part of us which reincarnates – called Manas in Sanskrit. The Lower Quaternary consists of (1) Our passional nature; the element of desire figuratively described as the “animal soul” – called Kama in Sanskrit, (2) Our vital nature; the life force or life energy which actually keeps us alive and in physical incarnation – called Prana in Sanskrit, (3) Our astral body; the subtle and unseen blueprint, framework, and mould upon and around which the physical body is built, it is the vehicle through which Prana flows to the physical body – called Linga Sharira in Sanskrit, and (4) Our physical body; which is really nothing more than our outer shell and the vehicle during life for the manifestation of all the other principles – called Sthula Sharira in Sanskrit. There is a great contrast between this and later teachings presented as “Theosophy.” Original Theosophy speaks of the conjunction of Atma and Buddhi as the Monad, the highermost universal part of our being. (1) Original Theosophy, which rarely uses the term “Christ” anyway, recognises “Christ” or “Christos” as simply a symbolic term and name for a universal spiritual Principle, and emphasises that Christ is not a person, an individual being, or an entity. (3) It also does not teach that the “Lord Christ-Maitreya” is the “Master of all the other Masters,” it does not refer to the other Masters and Adepts as “the Disciples of Christ,” and it does not maintain that Christ or Maitreya possessed or overshadowed the “Master Jesus” in order to complete or fulfil a mission which Gautama Buddha had been unable to adequately accomplish, as claimed in these later teachings of Leadbeater, Besant, and Bailey, the latter of whom wrote extensively on this theme. In other words, original Theosophy does not raise Christ to a position of pre-eminence and prominence above the Buddha. (6) It does not endorse the practice of promoting and reciting a “Great Invocation” – as in the Bailey teachings – in order to “clear the way” so that a great Avatar can return to the world of men more easily and speedily. It teaches instead that such rare events always occur in accordance with Cyclic Law and not according to the aspiration and longing of individuals. Although some people have claimed that the Theosophical Movement itself was founded in order to proclaim and prepare for the Second Coming of Christ, there is no evidence at all to support this. Rather than this doctrine being the central aspect of Theosophy, as some have said, it actually has nothing in common with the Theosophy presented to the world by H.P. Blavatsky. Although the original teachings of Theosophy refer at times to the fact that there are Masters, Mahatmas, Adepts, and Initiates, who are the guardians and custodians of the Esoteric Doctrine and its timeless truths, the emphasis is always without fail on the Philosophy itself and not on the Masters. Neither HPB, WQJ, nor the Masters themselves, ever divulged details and information about the roles, tasks, locations, past lives, hierarchical positions, levels, and grades of initiation of the Masters. The later teachers and writers we have referred to did exactly this, including drawing up and publishing complex charts and diagrams which purport to show the inner workings of the hierarchical structure of the Great Brotherhood of Masters. They also published detailed accounts of the physical appearances of the Masters and some described their supposed meetings and intimate friendliness with some of these Masters, whilst at the same time inventing various “new” Masters who are not found described or referred to in those positions in the original Theosophical literature, such as the “Master Jesus,” “The Venetian,” “Master R.,” “Master P.,” “Master Jupiter,” etc. There was also the insertion of Sanat Kumara as “The Great King, the Lord of the World,” the distortion of the true nature and role of the Maha Chohan, the anthropomorphisation of the Manu, and the exalting of “Christ-Maitreya” to the position of Master over the other Masters, who are frequently described as being the faithful “servants and disciples of Christ” and favouring ritualism, ceremonial, and the Christian Church, whilst Buddha is pushed well into the background, along with genuine Eastern esotericism. Original Theosophy does not revolve around a cult of the Masters nor their supposed pictures and portraits but rather around the life-giving, soul-satisfying, all-encompassing Esoteric Philosophy and Spiritual Science which the actual Masters gave to the world in the closing quarter of the 19th century through the one they called their “Direct Agent,” H.P. Blavatsky. Almost all the discrepancies, distortions, and alterations, which entered into the Theosophical teachings can be traced back to the issue of “Occult Successorship.” This is also the root cause of many of the splits that have occurred within the Theosophical Movement. There is no record or evidence to indicate or suggest any legitimacy or genuineness in the many claims and assertions made by numerous individuals about being the “successor” of H.P. Blavatsky. On the other hand, there are numerous letters and statements from the Masters themselves in which they emphasise that HPB is their “Direct Agent,” their “Brother,” “known to the world as H.P.B. but known to us by quite a different name,” that they have no chance of finding a better Messenger and Representative than her and that they endorse and approve her work and writings. The Master M. and the Master K.H., the two Masters most closely and directly connected with HPB and the Theosophical Movement, also certified in writing on more than one occasion that they were the real authors of “The Secret Doctrine” and that this monumental book was “a triple production,” the joint work of themselves with HPB. They also emphasised that it will take centuries before much more is given out from the secret teachings and that it is only in the closing 25 years of each century that they are able and permitted under Cyclic Law to have such direct involvement with humanity and the world at large, including the giving out of further teachings. But it takes a certain amount of humility, a real sacrificing of what has been called “the personal idea,” for one to be truly content and satisfied to remain as a mere transmitter and “hander on” of a Teaching which has already been given out. Within the hearts of many lurks the desire to be looked upon as a great leader, to be viewed as a Teacher in their own right, and to be admired and revered as a new “Messenger” for “new teachings” from the Masters. This, combined with the constant childish longing of the masses for “fresh revelations” and the “latest messages,” especially when they have not even bothered to make proper use of the huge mass of teaching and information already available, has resulted in considerable damage and tremendous harm for both the Theosophical Movement and the world of spirituality in general. If we familiarise ourselves with both the work and the writings of HPB; if we are able to perceive from the words of William Q. Judge, Damodar, Robert Crosbie and others, something of the true inner nature of that great Initiate; we may realise that the Being or Soul who was known to the general public as Helena Blavatsky could have no successor. We may also come to realise that the Message recorded by HPB is not of such a nature that it can be tampered with, altered, diluted, distorted, rewritten, or “revised” by those who consider themselves appointed or competent to do so. Respect for the Message, the Messenger, and the Masters, is the policy and approach of the United Lodge of Theosophists. The aim of the ULT, founded in 1909 by Robert Crosbie, is to endeavour to preserve, present, and promote the teachings of Theosophy in the way they were originally given to the world. This article, being a brief and condensed summary, only mentions five main points of difference between original Theosophy and the system of teaching which is often described as Neo-Theosophy or by HPB’s term “Pseudo-Theosophy.” There are in fact many more important differences and serious discrepancies. If one goes into detail and examines everything carefully, more than forty can be found. Apart from the issues mentioned above, major contradictions of various sorts exist in regard to such matters as the Seven Planes, the Seven Rays, the after-death states and processes, the Path of Initiation, the nature and evolution of the “angels,” the seven sacred planets, the Earth Chain, Shambhala, elementals, sexual relations, prayer, the role and value of East and West, ceremonial magic, the importance of philosophy, the value of religion, and so forth. These can be explored in other articles on the site, by going to the Articles page. The articles listed under the headings “Pseudo-Theosophy Revealed” and “The Masters” are of particular relevance. Clearly, as the Masters have said, two contradictory doctrines or teachings cannot both be true.